Convergence North/South, Qumaq Iyaituk, 2018, linocut, 39” x 66 1/8”, edition 1/1, framed, $6,600. Courtesy Feheley Fine Arts, Toronto. Convergence North/South, Passa Mangiuk, 2018, linocut, 39” x 66 1/8”, edition 1/1, framed, $6,600. Courtesy Feheley Fine Arts, Toronto. This exhibition features a printmaking project which took place in Ivujivik, Nunavik (Arctic Quebec). 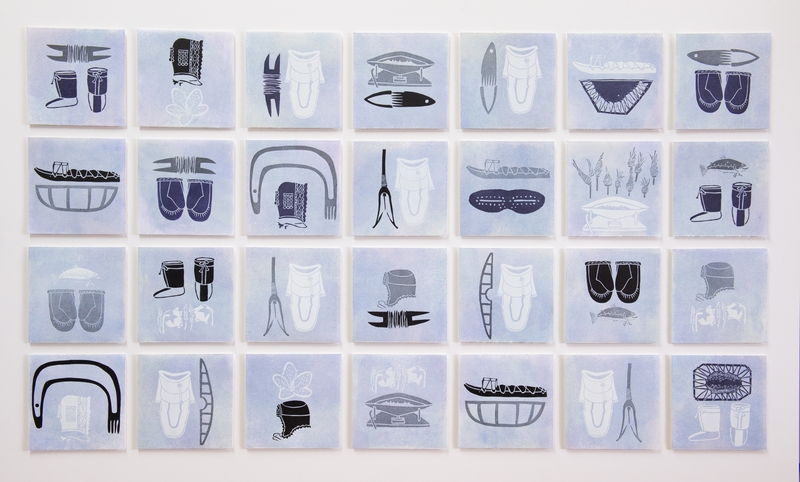 Three artists from Nunavik – Qumaq Iyaituk, Mary Paningajak and Passa Mangiuk – collaborated with Montreal-based artist and printmaker, Lyne Bastien. In addition to individual chine-collé prints, each of the four artists created their own panel of twenty-eight linocuts, as well as a fifth panel which was donated to Nuvviti School, in Ivujivik. The mixture of prints resulted in a mosaic-like effect of symbols, objects and artefacts related to Inuit culture such as the Ulu (women’s knife), the Qajaq (kayak), and the Unaaq (harpoon). The artists were familiar with Nunavik prints from the fifties and sixties; they appreciated the graphic qualities and the simplification of form that characterized the works. Therefore, linocut printing was chosen due to its similar process as stonecut printing which was practiced during the first exploratory period of printmaking in Puvirnituq, Nunavik. The collaboration allowed for an exchange in knowledge, points of view, and the exploration of basic color printing methods which was an enriching experience for each artist. 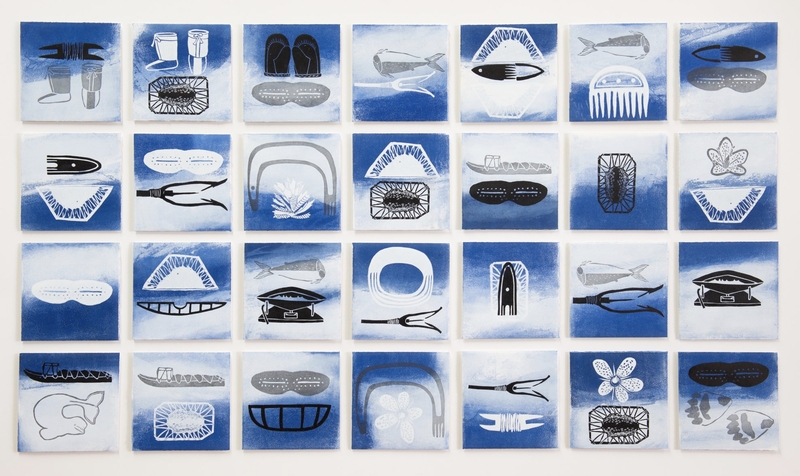 The elements depicted represent a part of quotidian life in the Arctic and are necessary for survival on the land: Paningajak was interested in northern plants for their shapes, and culinary and medicinal properties; Iyaituk focused on traditional Inuit clothing; Mangiuk was interested in the activity of fishing and the stretching of sealskin; and Bastien translated those same Inuit artefacts into abstract form. Coming from a different culture with different reference points, Bastien viewed these elements as shapes that she transformed into her own visual language. Two years since the project begun, this exhibition resulted in over one-hundred impressions of elements overlapping in a visual dialogue where North and South converge. Guidelines were initially established to maintain unity throughout the project. The artists first met to discuss how the project would be planned, the type of images used and their sizes to determine how the shapes would interact. From then, only two artists could work at a time due to the limited conditions of space. In fact, during the two previous years, the printing facilities moved from one building to another three times to make way for other activities and events. As a result, the artists moved the materials and equipment between the Kativik School Board house and Bastien’s Ivujavik home; the project was therefore created out of a Qallunaq’s living room temporarily transformed into a print studio. From their experience, the artists envision their own cultural center with a print studio run by a local that would contribute to the Ivujivik’ economy and other communities in Nunavik.